Renew Wisconsin: Wind turbine by port: What would it look like? 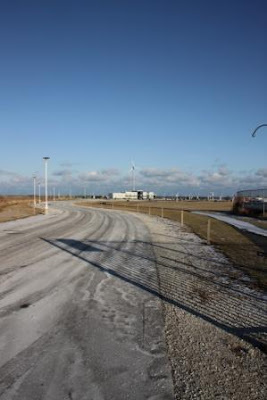 The city's Office of Environmental Sustainability has released renderings of what a proposed wind turbine near the Port Administration building would look like. Here are two views, showing one of each turbine. It's not an apples-to-apples comparison because they are shown at two different sites, one by the port building and one closer to the lakeshore near the Lake Express ferry terminal. The renderings were prepared by the University of WIsconsin-Milwaukee Institute for Ecological Design. Below is a view of the North Power 100, built by Vermont-based Northern Power Systems, near the Lake Express terminal. It's a 100-kilowatt turbine that would be 156 feet tall at the tip of the wind turbine blade. 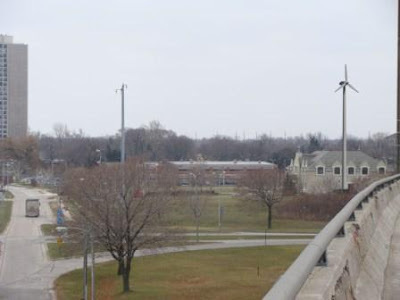 A community meeting to discuss the possible placement of turbines at one of the two sites is planned for 6 p.m. Thursday at South Shore Park Pavilion.